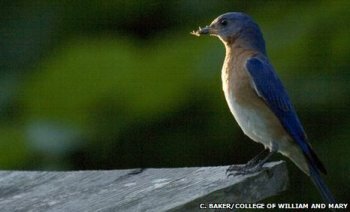 Ex-Master's student Alex Gunderson's ('07) study of how naturally occurring bacteria degrade the feathers of bluebirds is featured in the BBC on-line publication Earth News: "Feather-eating bugs" dull birds. Alex provided the first convincing evidence that feather-eating bacteria, which are common in many birds, change the visual appearance and condition of birds. Intriguingly, the bacteria had opposite effects on males than they did on females. The plumage of females became more dull and had lower health condition when carrying more bacteria; whereas males tended to get brighter (sexier looking) and gained in health condition. No one knows why these bacteria may be good for males but bad for females. Alex started by setting up bluebird nest box traps (custom made in the department's woodshop by Tom Meier) in the field. Bluebirds were banded, and plumage was collected. In the microbiology laboratory, Alex designed media selective for growing the feather-degrading microbes, and quantified the amount of these bacteria. Spectroradiometric color analysis was used to quantify the intensity of color of the bluebird feathers. Alex found that birds with dull feathers had more of the bacteria. As quoted by BBC editor Matt Walker, Alex Gunderson notes that "Feather-degrading bacteria could be an important force influencing the ecology and evolution of birds". Alex's study was published in the most recent issue of the Journal of Avian Biology and was co-authored by William and Mary biology faculty members Mark Forsyth and John Swaddle. The full paper can be accessed from John Swaddle's website. After graduating from William and Mary, Alex continues his academic career as a candidate for a doctorate at Duke University. Dr. Forsyth describes Alex as an excellent student who was very responsible, analytical, and independent: "It wasn't like John [Swaddle] and I sat down and decided to get a student to do this. This work wouldn't have happened if not for his interest in this study that bridges the disciplines of microbiology and evolutionary biology". Dr. Swaddle commented that "Alex was a unique student in that he had equal passion for ecological field work as he did for microbiology lab work. The combination of the two gave his Masters' project, and his training, a pronounced edge that his helping him design a very integrative doctoral thesis at Duke." Alex's work complements research conducted by W&M Masters' alumna Tina Whitaker ('03) and undergraduate Jessica Armstrong, who worked with Mark Forsyth and professor Dan Cristol on these feather-degrading microbes within cardinal plumage. Alex also worked with undergraduate Alicia Frame (‘07) to indicate that dark pigments in feathers help protect birds from feather-eating bacteria. In total, Alex has already published three manuscripts in international journals from his Masters' work at W&M-quite the achievement in just two years. Congratulations, Alex!